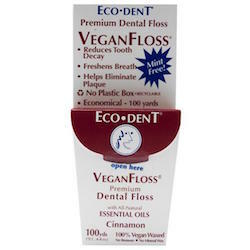 Eco-Dent floss has real benefits such as being vegan waxed; and made with a blend of natural essential oils and enzymes to reduce plaque and help you maintain healthy teeth and gums. Eco-Dent packages their floss in a cardboard carton rather than a plastic case to cut down on ecological damage done by plastic and the disposal of plastic. Ingredients: 100% Vegan-waxed floss impregnated with Cinnamomum cassia leaf oil, Anethole, Melaleuca altemifolia (Tea Tree)leaf oil, Citrus aurantium dulcis (Orange) oil, Citrus medica limonum (Lemon) peel oil, Foeniculum vulgar (Fennel)oil, illcium verum (anise) oil, Pelargonium graveolens flower oil, Citrus aurantium bergamia (Bergamot) fruit oil, Lavandula angustifolia (Lavender) oil, Rosmarnius officinalis (Rosemary) leaf oil, Ocimum basilicum (Basil) oil, Rose Flower oil.